Many enthusiasts pursue kite aerial photography (KAP) mainly as a sport and a means to acquire unique images. 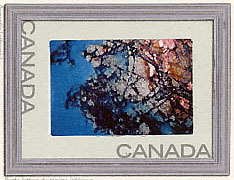 For example, the Canadian postage stamp (above) displays a kite aerial photograph of a rocky shoreline scene--a most unusual geologic view of fractured basement rock. KAP has developed a more serious side in recent years, with applications in science, engineering, and other professions. 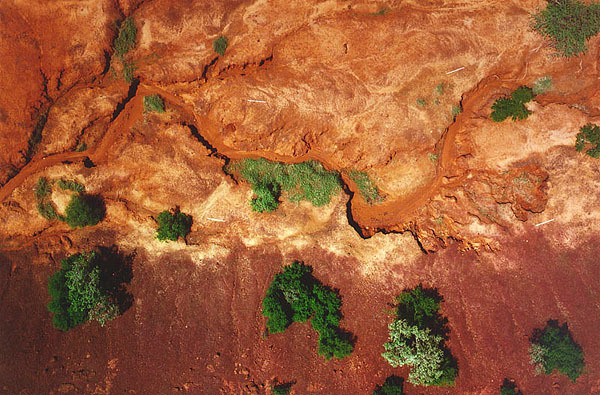 Low-height, large-scale aerial photography is often necessary for mapping and resource surveys in situations where conventional air photos would be difficult, costly, or dangerous to obtain. KAP has proven valuable for environmental site assessment (Aber et al. 1999). The following examples illustrate some of these modern applications. Documenting behavior of penguins in Antarctica (Carlson 1997). Penguins were photographed in nesting colonies on their breeding islands. The KAP rig was flown both on land and from a small Zodiac rubber boat. Operation of the rig did not disturb the penguins in any way, so the spatial distribution of penguins could be photographed. Geologic and archeologic mapping in connection with the wintering site of Dutch explorer Willem Barents in 1596-97 on Novaya Zemlya, Arctic Russia (Bults 1997; Gawronski and Boyarsky 1997). KAP was the basis for detailed survey of the remains of Het Behouden Huys, the winter house built by Barent's crew, after their ship became trapping in sea ice. Mapping of erosion. Drs. Irene Marzolff and Johannes Ries at Johann Wolfgang Goethe University, Frankfurt am Main, Germany, have considerable experience using a hot-air blimp for aerial photography. Their main objective is to map and interpret erosional patterns that develop in semiarid environments. For those times when the wind is too strong to operate the blimp, they have turned to kite aerial photography. They use a large rokkaku kite with a SLR camera. The camera is lifted into position with a sledge-like aluminium contraption running on the kite line. The following examples were taken in the sahel zone near Gorom-Gorom, Burkina Faso, western Africa. Survey markers are 2 meters (6½ feet) long. Used by permission, © I. Marzolff. Production of topographic maps. Warner (1996) has coined the term kiteography, which is the use of KAP in making large-scale topographic maps, based on photogrammetric principles. Overlapping, stereo-pairs of photographs are digitally processed to create maps and 3-dimensional displays of the ground. Mapping tree stumps of a fossil forest bed on Alex Heiberg Island, Arctic Canada (Bigras 1997a and 1997b). Remains of a 40-million-year-old forest are exposed on an eroding hillside in a permafrozen, tunda environment. The forest contains 1000s of perfectly preserved fossilized tree stumps in their original growth positions. Tree stumps and logs are situated in about 20 layers of forest-floor leaf litter. A stereo KAP rig was utilized to collect closeup, 3-dimensional imagery of the site. See Arctic KAP. Vertical stereo images of Arctic tundra landscape showing the fossil forest site. The darker portions contain leaf litter of the fossil forest. The light band is a silty clay deposit. The small brown spots are footsteps on the silty clay, which was utilized to cross from one area to another in order to minimize damage to the leaf litter deposits. Polygonal structures to left are permafrost features. Photo used by permission; © C. Bigras. Surveillance of sailboat racing maneuvers. The French national sailing team trains under the watchful eye of a video camera lifted by a parafoil kite from a nearby motorboat. This technique was used first for the 1996 European Laser Championships at Quiberon, France (Harris 1997). The method was utilized subsequently during training for the 1996 Olympics. KAP digital photography has been conducted by Japanese research laboratories for archeological (Philippines), architectural (India), oceanographic (Okinawa), and environmental (Japan) survey projects (Murooka 1998). Kite aerial photographs are often taken in conjunction with use of GPS (global positioning system) for locating survey markers on the ground. Such images may be digitally resampled into map coordinates or viewed in stereopairs to give a 3-dimensional impression of the ground. This approach is especially useful for geomorphology, which is the study of landforms. The following example illustrates an application of KAP for investigation of small erosional channels. The Ninnescah Research Station and Natural History Area is operated by Wichita State University. It is located adjacent to the Ninnescah River near Wichita, Kansas. The site is underlain by Permian bedrock of the Ninnescah Shale--red and gray shale with thin limestone beds. This bedrock lies near the surface and is exposed in stream channels and banks. A thin cover of loess and alluvial soil covers most of the surface. Much of the terrain is subject to flooding and has many marshes, terraces, channels and other fluvial landforms. The present geomorphology of the natural area is a result of downcutting and migration of the Ninnescah River. Significant channel lowering (at least 2 m) has taken place within the last 60 years, and local tributaries have responded by entrenching their channels. Management of the natural area is designed to restore native prairie vegetation and to create marsh and wetland habitats within small tributary valleys of the Ninnescah River. Site topo map and station overview. The objective the project was to collect kite aerial photographs that will be used for large-scale mapping of fluvial landforms (Aber et al. 1999). The primary focus was a small tributary basin south of the Ninnescah River. This tributary has entrenched channels, meanders, potholes, and other erosional features that display complex geometry. The following KAP procedures were utilized. Place survey markers at approximate 10-meter spacing along access trails either side of the corridor with stream channels. Additional markers were placed within channel network. Survey markers were made from 1-foot wide plastic tape in bright red and yellow colors. Tape symbols were held in position with bricks and stakes. Determine position of each marker with differential GPS. Readings were recorded in UTM coordinates--meters north and east within UTM grid zone 14. Take vertical KAP over survey area. Vertical photos depict ground areas roughly 50-60 m long by 35-40 m wide--need to have at least 4 survey markers visible within each photo for later digital resampling. Ground spotters with CB-radios helped kite handlers to position camera for each shot. Collect high- and low-oblique KAP views for entire natural area. Vertical photographs were selected for digital processing. This processing included scanning the original color film and resampling the digital image based on survey point coordinates. Image pairs were joined together to create mosaics of the stream-channel system. The resulting resolution of images is 10 cm (each pixel is 10x10 cm) with a positional accuracy of ± 1 meter (3 feet). Aerial photography with kites and a hot-air blimp, Johann Wolfgang Goethe University, Germany. Atmospheric dynamics at CIRES, University of Colorado. WindTRAM from CIRES, University of Colorado. Flying high from The Why Files, University of Wisconsin. Aber, J.S., Sobieski, R., Distler, D.A. and Nowak, M.C. 1999. Kite aerial photography for environmental site investigations in Kansas. Kansas Academy Science, Transactions 102:57-67--see abstract. Bigras, C. 1997a. Fossil forests of the far north. The Aerial Eye 3/2, p. 4-5, 20-21. Bigras, C. 1997b. 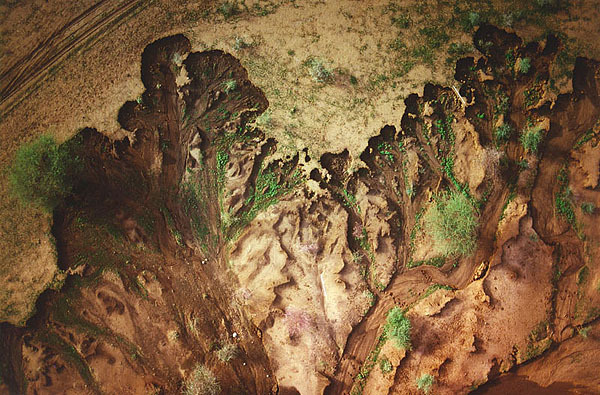 Kite aerial photography of the Axel Heiberg Island fossil forest. American Society of Photogrammetry and Remote Sensing, Proceedings of the first North American symposium on small format aerial photography, p. 147-153. Bults, P. 1997. Northeast to Cathay. The Aerial Eye 3/2, p. 10-11, 24. Carlson, J. 1997. Kiteflying in the freezer. The Aerial Eye 3/2, p. 6-7. Gawronski, J.H.G. and Boyarsky, P.V. (eds.) 1997. Northbound with Barents: Russian-Dutch integrated archaeologic research on the Archipelago Novaya Zemlya. Uitgeverij Jan Mets, Amsterdam, 255 p.
Harris, Z. 1997. Keeping a high eye on sailors. KiteLines 12/3, p. 13. Murooka, K. 1998. Advent of the digital camera age. The Aerial Eye 4/1, p. 18-19. Warner, W.S. 1996. Kiteography. The Aerial Eye 2/2, p. 16-17, 19.